Avocados have a wonderfully unique flavor and texture and are for that reason one of my favorite fruits (it has a pit so it’s a fruit, right?). I also love guacamole but with avocados selling for more than a dollar a piece for most of the year, it doesn’t make much sense to mash up four of them just to make a little bitty bit of guac. SO I used Budget Byting Principle #2, pairing inexpensive ingredients with more expensive items to bring the total cost/serving down, to make it more reasonable. I used tomatoes as a “filler” item and bulked up what would otherwise be unmashed guacamole. Also, I waited until after winter to pull this recipe out of my hat because avocados are only $0.79 each at our local produce market right now. YES! You can also use black beans or corn kernels for extra filler, flavor, texture and fiber! I’ve been eating this salad with tortilla chips (I bought a big bag for only $2), straight out of the container with fork and ALSO on a toasted english muffin with a fried egg for breakfast. Yes, I will put just about anything on an egg sandwich but this is especially good in a mexican-veggie-omelet sort of way. Try it! 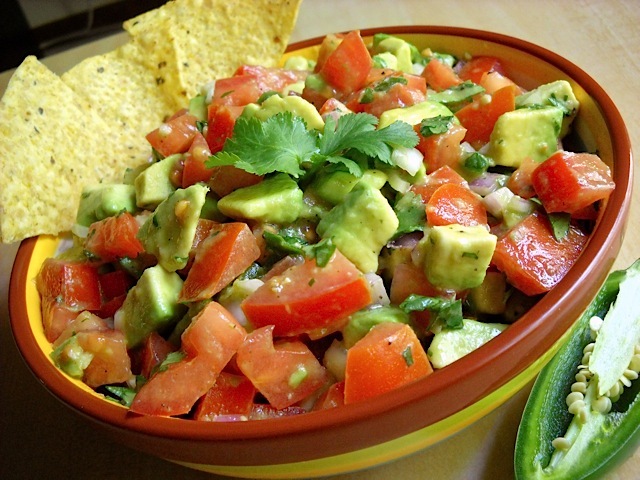 All the flavors of guacamole in a simple, cost effective, and deconstructed salad. 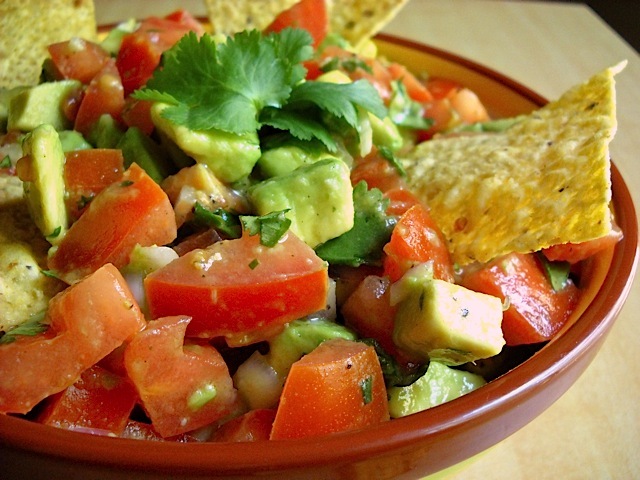 Dice the tomatoes, jalapeno, onion, garlic and cilantro and place them in a bowl. Dice the jalapeno, onion, garlic and cilantro very finely while leaving the tomato in larger chunks (approximately 1/2 inch square). Dice the avocado about the same size as the tomatoes. Save the avocado for last to minimize the time that it is exposed to oxygen and reducing the likely hood of it turning brown. Once the dressing is mixed in, the acid from the tomatoes and lime will keep the avocado from turning brown during storage. In a small bowl combine the olive oil, juice and zest from the lime, salt and pepper. Pour the mixture over the diced vegetables and stir to combine! 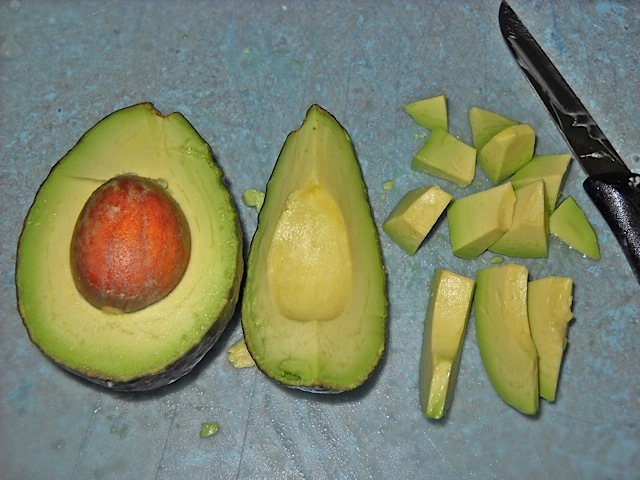 To dice an avocado, first cut all the way around the pit. Twist the halves until one side comes away from the pit. Slice that half again vertically then peel back the skin from each quarter. Each quarter is now ready to dice! NOTE: The more you stir the salad, the more the avocado will break down and make the dressing “creamy”. So, when adding the dressing, stir very gently. After refrigerating the mixture (if you don’t eat it all immediately after making it), stir gently again before serving. A lot of recipes are best after the flavors have time to meld but I have to say I liked this one best right after making it. The separation of the flavors made it more interesting and provided variety with every bite. Now, don’t get me wrong. It has been 4 or 5 days since I made this and I’m still holding myself back from eating the entire container. It’s so fresh and delicious! This salad is awesome! It was quick and easy to throw together. The only thing I would say is that next time I’ll use two limes and increase the jalapenos; I like spice. While this batch is being hoarded and not shared, I also plan on getting the ingredients to make it again for a potluck staff meeting I have later this week. I think it will be a hit, though I think for others I’ll leave out the jalapeno. I did on Saturday … with ciabatta toast done and handed them with guacamole … delicious! I am SOOOO glad i found your site!! i found 6 ripe avacados for 99 (OMG WOW!) and was thinking I should make guac, but knew you’d have something more fun and awesome! VOILA! thank you so much and LOVE your book!! Just made this. So delicious! Thank you. This salad is also tasty with low fat italian dressing. Something about the dressing and avocado that works well. I also love mixing the avocado and grapefruit sections with a little of the italian dressing. Wonderful combination. your posts are so amazing thanks so much for sharing everything with us! I just made this YUM!!!! Also this would be great with some tuna tartare mixed in. Let me first thank Christian for making the comments section uncomfortable. Second, this is a great recipe. Unfortunately avocados around here were $2 each, which really jacked up the price. So funny to see this–I recently had a very similar epiphany regarding my beloved avocados. For a quick/light nosh, I started scooping out chunks of avo, throwing on wedges of tomato and seasoning with sea salt & cracked pepper. Very easy to dress up if desired. Definitely a new favorite. How would red peppers or corn go in this? That looks very delicious, and also light and colorful, perfect for spring.